The XM-G50 is a intake which is naturally radially mounted, although the ability to attach the StrutCo Cubic Octagonal Strut radially has allowed for functionally radial mounting of intakes designed for node attachment to the ends of fuel tanks. The XM-G50 Radial Air Intake is an air intake for jet engines. It collects more oxygen at higher velocities, simulating more air passing through the intake as the craft velocity increases. Before changes in 1.0.5, the intake had an unusually high impact tolerance of 80m/s and seeming hydrophobic nature. Because of this, radial intakes were the go-to stock part for watercraft such as boats, jet skis and seaplanes. Credit for popularizing this perhaps goes most to YouTuber Danny2462 who played with them in a series of videos, beginning with a Dec 9, 2012 video called KSP Moments: Intake Skipping, progressing to Intakeology on Dec 8, 2013 and Absurd Contraptions: Water Strider on Feb 9 2014. More practical use of the XM-G50's aquatic qualities was demonstrated by YouTuber Scott Manley's April 13, 2014 livestreamed building of a seaplane which was rather successful. 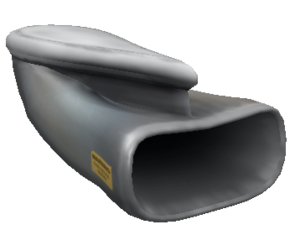 “ A must-have for air breathing engines, this intake duct will pull in outside air to run turbine engines on, as long as there is any outside air to begin with, of course. Warranty does not cover engine flame-outs or any objects, inanimate or otherwise, sucked in by the intake. “ Tired of sucking in air directly from the front of something, an intrepid designer asked the question. "Why not make an intake that sticks out, then we can put one anywhere!". Shortly thereafter the XM-G50 prototype was constructed. However this led to a tragic abuse of intakes in SSTO designs. This page was last edited on 17 November 2015, at 22:59.